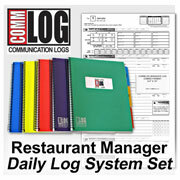 COMMLOGs are systems of preprinted spiral bound notebooks designed to make daily restaurant business logging and planning organized and easy. (These are bound paper books, not computer software.) 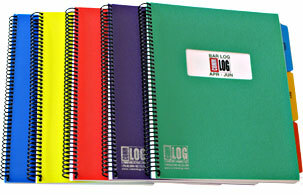 Quarterly Manager Logs capture daily sales, schedules, plans, memos, shift notes, etc. Other log types available: Request Off, Switch Shift, Reservations, Guest Relations, Maintenance and more. COMMLOGs are systems of preprinted spiral bound notebooks designed to make daily restaurant business logging organized and easy. These items are not software and do not require a computer or internet connection. These items are in our catalog because they are effective restaurant management solutions, which is what FoodSoftware.com is about. Improve communication, overcome lack of documentation, information and organization. Know what happened when you weren't there! Clearly document issues and guide users to solutions. Increase responsiveness, resolve problems and help your managers leave you with solutions and not just problems. Increase productivity and profitability. Know where the data is and spend less time looking for it. Better data means less work! COMMLOGs are perfect for all hospitality situations, including training environments, new managers or any time that structure is needed in your manager communications. Manager Log: View Captures sales, staffing, purchases, employee issues, interview schedules, plans, memos, accidents and shift notes (8.5 x 14, quarterly). DayPlan Pocket Planner: View A pocket-size version of the manager log (5.5 x 11 folded to 3.6 x 5.6, pad of 100 sheets). COMMLOGs are sold in group sets as follows. Where pages are dated, the logs span quarter years. You can select the set you want when you put this item in the shopping card. For examples of all log types, click on the View links under Available COMMLOG Types above. Below is an example of a Manager Log page.